Planning a family vacation? A romantic getaway? An adventure with friends? Since 1984, Rentvillas.com has specialized in helping travelers like you plan extraordinary experiences in villas, apartments, farmhouses, cottages, and castles. Leave behind the anxiety of booking a place sight-unseen. Photos, suggestions from previous renters, and your free personal travel advisor will help you avoid mistakes. Turn your "good trip" into an unforgettable journey. simply send us an e-mail, and we will reply promptly with a quotation! This website accepts bookings for next year, should you wish to book in advance. 3 Bedroom Villa in Aldeia do Golf, near Vilamoura. AC in bedrooms and living room. Cable TV and Internet. Fully equipped kitchen. Outside barbecue. Situated in Soalheira, Loulé ... 6 Bedroom Villa near Loulé, with pool, AC, and partial sea view! Situated in Carvoeiro... 4 Bedroom Modern Villa 3km from the beach, with pool, 3 wc, terrace and barbeque! Situated in Boliqueime... A villa with 8 bedrooms and private pool in Alfontes, Boliqueime A / C in all rooms. Wifi. 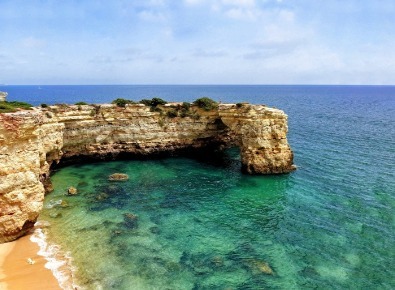 Situated on the top of a hill panoramic view over the entire Algarve coastline between Vilamoura and Lagos. Casa de Mós is an amazing and modern villa situated just 750 meters from the beach of Mós and only 2.5 km from the historic city of Lagos where you will find everything you need. 5/7 Bedroom Villa with private pool. Located close to the Vila Sol Golf course and within a five minute drive to Vilamoura and Quarteira. The main house features downstairs, a lounge and dining area with air-condioning and with open plan seating, satellite television and dining table.Further accommodation is available apart from the main house, across a courtyard with its own separate access. 3 Bedroom, 1 Bathroom Villa with private pool! This comfortably furnished, one level traditionally styled villa is in an excellent location for enjoying all the facilities in the resort of Praia da Oura/Montechoro, just a short stroll from the famous ‘Strip’ . The beautiful beaches of Praia da Oura and Forte Sao Joao are approx 15 minutes walk. 3 Bedroom villa with private pool... Villa Manuela is situated on a cul-de-sac in the Old Village area of Vilamoura. Excellent for groups looking for tranquility, but at the same time proximity to all facilities such as restaurants, bars, supermarket, etc. 4 Bedroom villa with private pool. This villa is located in the famous Vilasol golf complex. Ideal for those looking for tranquility for their holidays but without giving up the pleasures of cosmopolitan Vilamoura that is approx. 4 kms.